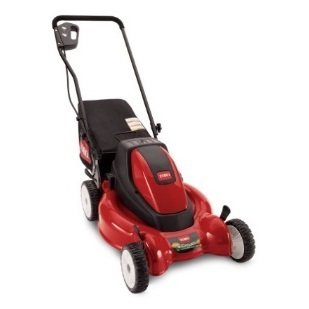 Troy-Bilt self-propelled lawn mower offers electric start, a more quiet alternative to a regular motor start. Save yourself money on gas and use electricity as a cleaner substitute. Since this machine starts with electricity, it lessens that amount of gas that is polluted into the air. A regular gas start causes the user to pull the cord multiple times emitting more gas into the air than if you were using electricity to start it. 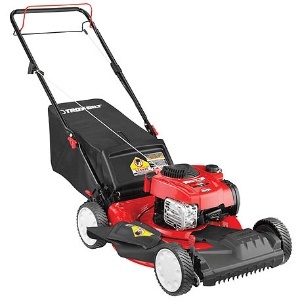 Featuring a Briggs & Stratton engine, a rake bumper, and a blade designed for finer mulch, this lawn mower has all of the popular characteristics of a typical gas mower with only a portion of its pollution emission. No gas, no oil, no emissions. Since it uses absolutely no gas, it does not pollute the air. This eco-friendly lawn mower runs on a 36 volt cordless system. Powerful and quiet, it requires no maintenance and has an array of features, including a 20-inch steel mulching deck. If you are looking to upgrade certain parts of the lawnmower, you have the option to choose Toro parts or Tecumseh parts to do so. Compared to other cordless electric lawn mowers, the Toro e-Cycler is much lighter, weighing only 77 lbs. Manual mowers are often the best environment-friendly option because they are powered by human power. Manual mowers do not release as much carbon while you mow your lawn, but they do require more effort on your part. If you don't mind getting a workout while you mow your lawn, this manual mower is a great option. This specific semi-manual model runs on a Honda GCV160 engine and weighs only 66 lbs. The Honda GCV160 engine is certified to meet 50 state EPA and CARB emission levels, proving that it is environmentally safe. Avoid the hassles of gasoline, oil, battery charging, and electrical cords with this eco-friendly push reel mower. The advanced design of the cutting system makes it 30% easier to push that and offers 50% more cutting power than standard reel mowers. With no gasoline or oil involved, this mower will not pollute the air at all. The combination of an InertiaDrive Reel and the StaySharp Cutting System makes for an incredible eco-friendly lawn mower. Troy-Bilt has done it again with this new self-propelled mower, equipped with a Briggs & Stratton engine and a front-wheel drive transmission. This engine also comes with a Ready Start system which does not require the typical priming and choking of a regular gas motor start. Less choking and priming means that less gasoline and carbon is emitted into the air. 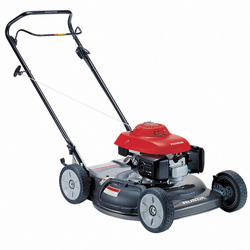 This gas mower is typically better suited for flat lawns and does not have the power of a riding mower. However, it is easy to use and eliminates clumping. Like other gas mowers, take proper care of the engine and you will find yourself taking care of the environment. Thanks to new emission laws, this is only a small list of eco-friendly lawnmowers. Technology is constantly advancing and lawn mowers are steadily adapting to it. If you need parts for any of these mowers, visit HLS Pro Parts.